I've seen multiple sources attribute the clear flames to the use of hypergolic fuels for propulsion, but I have been unable to find any explanation for why hypergolic fuels burn clearly. Flame color should not be directly related to hypergolic...ity(?). Rather, it's dependent on the chemical properties of the particular fuel and oxidizer, and their products. The Titan II also used storable propellants: Aerozine 50, which is a 1:1 mixture of hydrazine and unsymmetrical dimethylhydrazine (UDMH), and dinitrogen tetroxide. As to why those chemicals burn with a colorless flame, I can tell you that it has to do with electron configurations and excitation states, but for any more detail, you might want to ask on the chemistry site. I read in the book Ignition by John D. Clark about the liquid rocket fuel history in a footnote on page 105 that the Titan II flame is distinct in being nearly invisible because of the N2O4 and 50:50 propellants. The author writes that the LOX RP-1 mix has free carbon which produces a luminous flame. Elsewhere in the book is mentioned that a stated goal of the propellant designer is to avoid carbon in the exhaust as it provides little to no thrust being a solid so it may be that all the carbon in the hypergolic mix is burnt to CO and becomes a colourless gas while providing thrust. 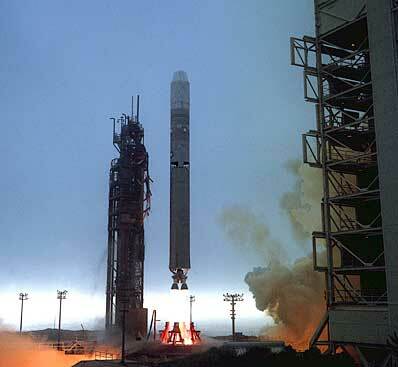 The Titan I used LOX and RP-1 so would have shown a bright orange exhaust. There is a picture of a Titan with carbon containing exhaust plumes down on a Popular Science page but this may be a Titan I even though it is captioned a Titan II or it may have been retouched to add colour where there was none (for artistic reasons). Compare with the image in this question and on the Titan II wikipedia page. Not the answer you're looking for? Browse other questions tagged launch rockets fuel liquid-fuel exhaust or ask your own question. Why not plug it into the wall? What is the flyaway cost of a Soyuz and Proton Rocket? Why is one of these two concurrent fuel-dump spirals blue? What's the actual oxidizer/fuel ratio in the combustion chamber of the Vulcain?